If you crave sourdough bread from San Francisco, this San Francisco Sourdough Starter Culture is the perfect sourdough starter for you. 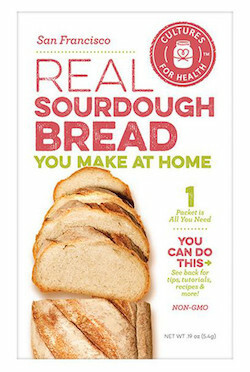 Use it to make sourdough bread, pancakes, and a wide variety of other sourdough baked goods. Each box contains 1 packet of dehydrated San Francisco Sourdough Starter Culture which can be used repeatedly to leaven baked goods. One packet is all you need. Store in a cool, dry place until ready to activate using white flour and water. Easy to maintain; complete, easy-to-use instructions included. Activate using white wheat flour and unchlorinated, unfluoridated water. Ingredients: Organic white wheat flour, live active cultures.